Overconsumption of protein occurs in all of the world’s regions, and it is rising in developing and emerging economies. In 2009, the average person in more than 90 percent of the world’s countries and territories consumed more protein than estimated requirements. Global average protein consumption was approximately 68 grams per person per day—or more than one-third higher than the average daily adult requirement. 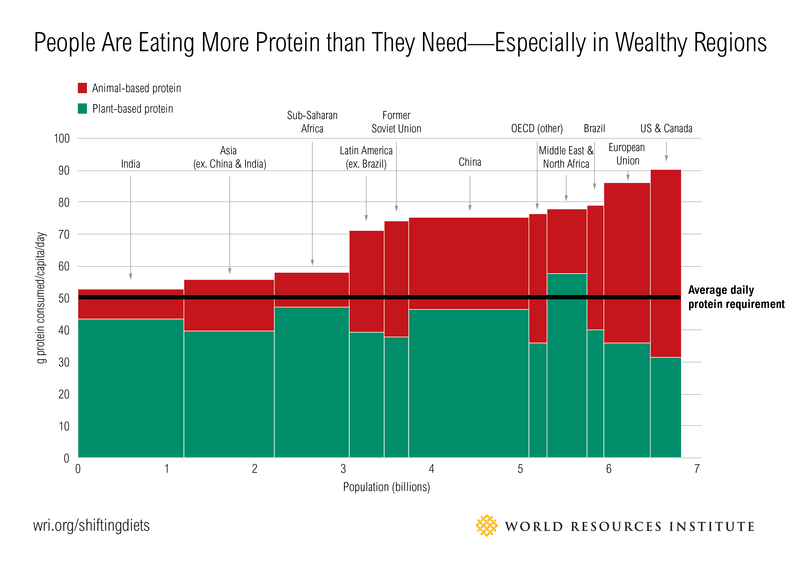 In the world’s wealthiest regions, protein consumption was higher still. In addition, the share of animal-based protein is growing in people’s diets relative to that of plant-based protein. Between 1961 and 2009, global average per person availability of animal-based protein grew by 59 percent, while that of plant-based protein grew by only 14 percent. Looking forward, total consumption of animal-based food is expected to rise by nearly 80 percent between 2006 and 2050. Although per person animal-based food consumption may be peaking in developed countries where consumption is already high, it is projected to rise in developing countries, especially in emerging economies and in urban areas. This chart is based on data from the Working Paper, Shifting Diets for a Sustainable Food Future.